The issue I’m facing is that whenever I run station on my macbook pro it requires to use the discrete graphic card of the laptop (not required by other apps) which drains the battery life much faster. Since Station has the ambition to become a workhorse for many people, it would be great if it could consume less energy on such hardwares. Can we make station not activate the discrete graphics cards in Macbook Pro laptops? Performance on Macbook Pro 15"
Hello, I discovered Station yesterday and want to say firstly I think it’s a huge step in the right direction for an improved work experience. 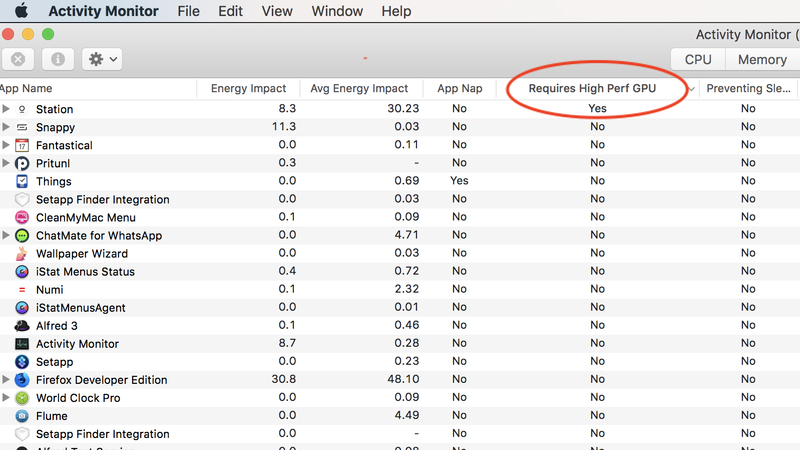 I work in an environment where I need to work on battery for most of my day and I did notice that today I wasn’t able to make it past noon while using my MacBook. Typically I’d get about 5 - 5.5 hours. I only managed about 3.5 - 4… The only difference was I used Station instead of chrome. Also, there seems to be some noticeable lag when I type. I’ve only typed in gmail and docs so far. Significant consumption; avg. energy impact is ~40 after several hours of steady use. Unit is always quite warm to touch and total battery life is cut by a third. To note, the footprint seems to roughly mirror usage of Chrome, which I find quite taxing on my system as well. Love this app. At this rate, I might switch back to running a series of pinned tabs in Safari. Would be really great if you guys could figure out how to make this a power sipper; truly one app to rule them all. The issue I’m facing is station is draining a lot of battery because it is always using the discrete graphics instead of integrated graphics. Please give me an option to use integrated graphics to get better battery life. Issue: Station always uses the discrete graphics which results in poor battery life. Station leads to switching to heavy graphics card on Macbook Pro 2018 15’ from Intel to Radeon. This leads to faster battery drainage. Issue: Station leads to switching to heavy graphics card on Macbook Pro 2018 15’ from Intel to Radeon. This leads to faster battery drainage. Hi Everyone, I reported same issue with GPU discrete card and also battery drain connected to it. Did anyone try with gfxcardstatus for Mac? Will be realease any eventually update that would fix it? My problem is that station activates the discrete graphics cards in Macbook Pro laptops, seemingly for no reason. This creates a larger than necessary battery drain. See the photo below for proof. It seems like “open /Applications/Station.app/ --args --disable-gpu” works to disable the discrete gpu. Why hasn’t Station made that the default when launching? Font rendering on Windows 10 with Intel Iris 6100 GPU (running dual boot on MacBook Pro 13’’ early-2015) is poor (type is blurry) when using hardware acceleration. I’ve found this issue multiple times in many different software applications, and the solution is almost always to turn off graphics hardware acceleration. Is there a way to enable hardware acceleration to become an option in Station’s Options menu? Hi guys, I’m loving station but battery life is about 30% of what it used to be before station and my macbook pro gets extremely hot. How do I minimise the effects on battery? As soon as I start Station the power consumption of my Laptop jumps from 5,5 W to 12 W. If I keep station open without using it the power consumption goes down over time to 9 W. As soon as I use it, it is back up to 11,5 W.
That is absolutely extreme and actually keeps me from using this app . Would it work normally when we force integrated GPU?